BRIGHTON, Mich - The International CES will be a huge event for Ford Motor Company. Between the all-new Ford Mustang hype and new technology announcements, Ford will definitely be stealing some spot light. An exciting portion of the event for the Ford company will be the debut of the solar hybrid concept car at the International CES. Now, what exactly is this solar hybrid concept car? Well, it is an environmentally-friendly, solar-powered concept car that offers the very same performance qualities as a plug-in hybrid. The unique quality with this hybrid car; there is no need for a plug. 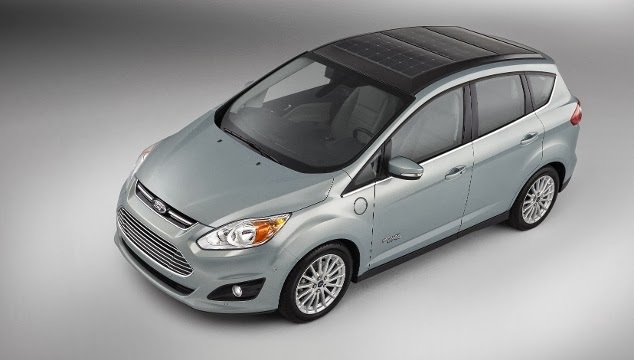 The C-MAX Solar Energi Concept car utilizes a gasoline engine combined with a gizmo that serves as a magnifying glass to concentrate the sun's rays on the vehicle's roof-mounted solar panels. One of the best parts, the consumer could expect city-highway mileage to be 100 miles per gallon! Ford says that using solar power rather than an electric plug, allows a typical owner to reduce their annual greenhouse gas emissions by four metric tons. Less pollution of the environment and better gas mileage for us? Sign us up! Hybrids are becoming more and more attractive to the consumer; Ford sold about 85,000 hybrid or electric vehicles in 2013 and 6,300 of those units were the C-MAX Energi plug-in hybrid. The solar concept was developed by a group of researchers at the Georgia Institute of Technology. It uses Fresnel lens, which concentrates light but can be made thinner than a conventional lens. A full day of sunshine is equivalent to a four-hour battery charge. With a full charge, the hybrid should have a range of 620 miles and will still include a plug-in port for standard electric charging. After the debut of the solar hybrid concept car at the International CES, Ford will test the vehicle with institute researchers and determine if it is feasible for mass production. We can't wait to see what this year has in store for Ford Motor Company. Brighton Ford is your local dealership with the widest inventory of new, used, and pre-owned Ford vehicles. Visit us today to find the perfect vehicle to start off the new year!